When going back to Jewsons on the request of Frank Lloyd he promised me he would find a future for me in retailing. He kept his promise as he introduced me to a group of retailers he was working with. Frank had teamed up to form a buying group with Barkers of Hudderfield, Craven of Wakefield, Knuttons of Bradford, Walkers of Keighley and Nicholl and Brown Halifax, they would meet and pool their orders in a way to get discount from the likes of Dunlop Sports and Slazenger. The group was working well so they decided to buy a business together to centralise the operation. They bought Kays of Brighouse an old fashioned toy shop aslo selling sports and a large range of leather goods and travel goods. I was recruited in 1970 as manager with 14 staff and they more or less gave me a free hand to run the place. We also developed storage space to hold the joint buying projects and formed a company named Sports Bulk Buyers which I would also manage. I was secure enough to get a mortgage to buy a house in Mayster Grove, Rastrick, a two bedroomed bunglow for just £ 2,750, 5 years later I sold it for £ 7,500 and bought a three bedroomed semi in Cargreen Rastrick for £ 9,400. Within two years I had increased the business and had a share in the profits so by 1972 I earned my first £1,000 in a year. That was a good salary in 1972 about the same as first team players were getting at Halifax Town. Apart from running the retail business I also had to deal with SBB's buying requirements for 5 other shops. Kays of Brighouse gave me management skills and the confidence to negociate buying deals foer the group. 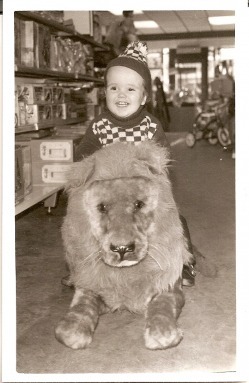 My son Simon was born in 1974 and he was a great toy tester and very popular having a father who managed a toy shop. One marketing ploy I had picked up at Nicholl and Brown was to run a Christmas Club, we had one at kayes but it was not promoted well. The idea was to incurage customers to save weekly or monthly in the club, at anytime they could select what toys they wanted for Christmas and we would store them ready wrapped in a storeroom until Christmas. Like today some poular toys are short at Christmas but we would guarantee supply. I built the club up to 400 members, bearing in mind they would pop in the shop to put their savings down and that was another opportunity to sell them something. By 1977 the Christmas Club represented more than 10% of our entire annual business. In 1977 Paulines uncle was visiting from America and he was telling me I should get involved in skateboards as the trend was massive in the States. My bosses were not interested in buying a container load of California Sun boards as they thought it may be a quick fad. So I decided to buy one myself, store them in a friends warehouse and got a few toy reps to sell them to the trade. SBB found out and also bought them from me. Now I never thought I was doing anything wrong but in truth there could have been a conflict of interest as I was running a business and being paid by SBB to run their business. The directors never confronted me on the subject and it became a grey area. In retrospect I should not have done it because it appeared to be sneeky although I had told them what I was doing, at the same time they should have objected but they did not. The skateboard business was going so well I could not honestly continue doing both and I was earning good money with St Julien Duo. So we had a heart to heart meeting with the directors and at the same time they informed me that they had received an offer for the business from Bob Worthington so if I wanted to part company they would take the offer. Part of the deal included me staying on for a month to work along side Bob in fact Bob was happy for me to stay on if I wanted. We knew each other from Halifax Town days as Bob was from the footballing family, Dave who captained Grimsby, Frank played for England and Bob for Notts County and all started as juniors with Halifax Town. I had decided however to form a company named Simon Sports to sell skateboard equipment and hopefully import of sporting items. So with some regrets I left Kays of Brighouse in 1977.